A screen grab from the Spanish language version of the Crossroads GPS television ad. 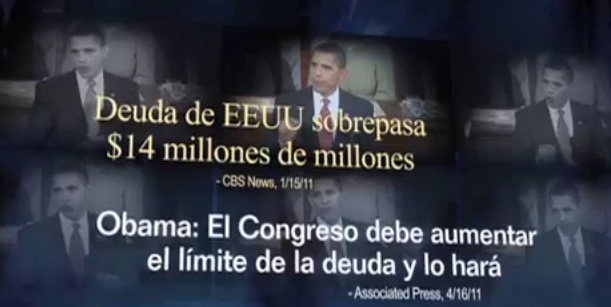 LAS VEGAS -- In the swing states of Nevada, New Mexico and Colorado, the Republican Party has released a brand new television commercial in English and a radio ad in Spanish that attacks President Obama's economic policies. They join other ads tied to the national debt limit issue put out by Crossroads GPS, a conservative organization founded by Republican strategist Karl Rove. This week, the organization released a Spanish version on Univision stations in the same Southwestern markets as the Republican Party ads. The Crossroads GPS ads shows a woman who can't sleep because she is so worried about the rising deficit. The Spanish version is the organization's first foray into Spanish media, and it is part of a $20 million advertising campaign. "The key audience of the ad is people who have supported Obama in the past and have given him the benefit of the doubt," said Jonathan Collegio, a spokesman for Crossroads GPS. He said the high unemployment rate among Latinos is a reason why they should be disenchanted with the president. And its also why conservatives are reaching out for Hispanic support now. "As the president and Congress are negotiating this debt limit, it is crucial that job killing taxes are not included in that final legislation," Collegio said. A political observer called it the latest attempt by the GOP to woo Latinos. "It's a crafty move and an indication of what is to come," said political columnist, Ruben Navarrette of the Republican strategy to put out Spanish language ads now. According to Navarrette, Republican candidates will need more than 30 percent of the Latino vote to win the White House. "It's part of a continual stream of attempts by the Republican Party to reach across the divide and try to mend fences with Latinos because the Republican brand is so badly damaged with Latino voters," Navarrette said. And this is just the beginning of the political ad season.